If you follow me on MyFitnessPal or Fitocracy you may have already seen this recipe, it’s one of my favorites. This dish satisfies the craving for the saucy, meaty, cheesy goodness of lasagna but for far fewer calories. 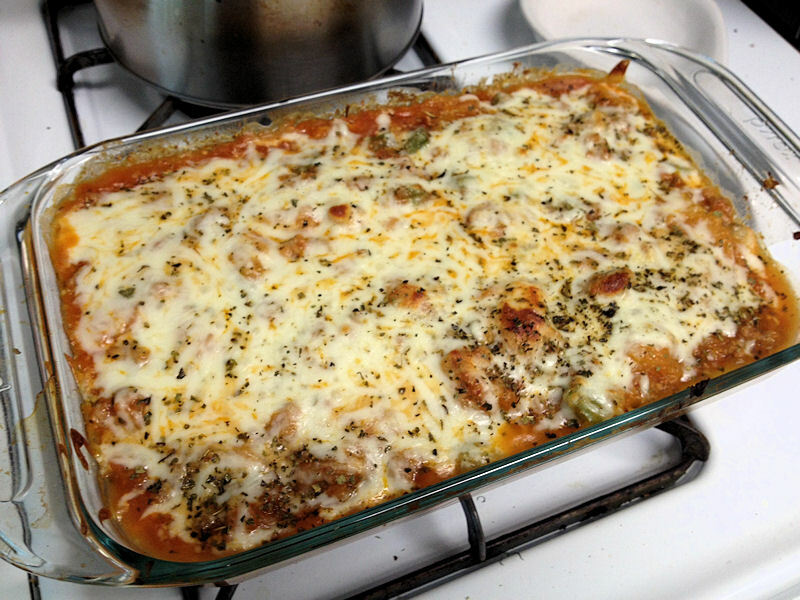 It also has much lower carbs and overall fat than traditional lasagna. The recipe makes a large pan and each serving is 1/4 of the recipe, a pretty hearty serving. Pair this with a nice salad with a vinaigrette and you’ve got an excellent meal under 500 calories. Cook sausage, garlic and onions in a pan and drain any excess fat, if you used lean turkey sausage there probably will be little to none. Add the peppers and mushrooms and cook until almost soft, pour off any excess water. Add marinara and heat through then add spaghetti squash, stir to mix and then pour into a casserole dish. Top with mozzarella and parmesan and chopped oregano then bake in 350F oven for about 15 minutes until cheese is melted and casserole is bubbling. If you choose, and to make this more like a traditional lasagna, you can layer the sauce, squash and cheese in the casserole dish. I don’t have the exact numbers but this does have a good amount of sodium. Make sure to get LEAN turkey sausage! Many people don’t know this but unless the package is marked as lean it probably contains the turkey skin ground up in the sausage. This really kicks up the fat and calories. This also applies to ground turkey, ground turkey that is not marked as lean has higher fat and calories than 90/10 ground beef. If you’re really trying to watch the fat you can use fat-free cheese. Personally I think you lose too much taste and texture using fat-free and the caloric trade off isn’t worth it. You can also use soy crumbles if you want to make this vegetarian friendly, just season it with a bit of garlic, oregano and basil. MMMmmm. Saucy, cheesy Italian goodness.